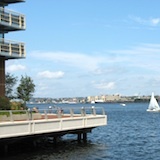 Many visitors regard the Boston Marriott Long Wharf as top choice among Boston waterfront hotels. 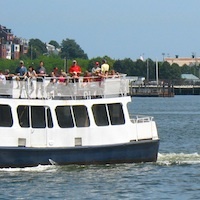 If you are flying into Boston Logan Airport, hop on a water taxi and you can be at the Marriott Long Wharf in 8 minutes or less. 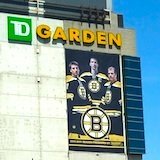 International makes it an attraction option if you want to be in Downtown Boston for business, explore nearby attractions such as the Freedom Trail, and enjoy a Bruins or Celtics game at TD Garden. Perched on historic Long Wharf, the Boston Marriott Long Wharf enjoys one of Boston's best locations. 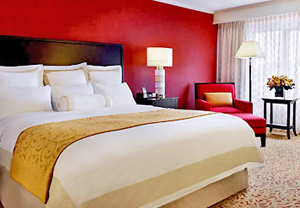 What does the Boston Marriott Long Wharf Hotel offer? 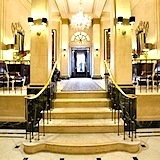 The hotel is big - 397 rooms and 15 suites. Each room has a spectacular view of Boston Harbor or the picturesque North End. Rooms feature large flat screen TVs and the comfortable furnishings for which Marriott is famous - the super-comfy beds, down comforters, and all the plush pillows you could possibly want. You can enjoy the hotel's indoor pool and well-equipped fitness room. For spa services, you'll get access to Rowes Wharf Health Club and Spa at the nearby Boston Harbor Hotel. Kids especially love the Marriott's video game room. If you're visiting with young children, you'll also find an exceptionally nice playground (one of my own kids' favorites when they were younger) on the north side of the hotel in the adjacent Christopher Columbus Park - one reason why this is considered one of the best kid-friendly Boston hotels. The hotel's restaurant, Oceana, serves breakfast, lunch, and dinner, specializing in seafood. You'll also find a Starbucks in the lobby. However . . . you're also surrounded by other excellent restaurants. Across Atlantic Avenue is Legal Seafoods, one of the best Boston seafood restaurants. Next to the hotel is Chart House. Only a few blocks away, you'll find dozens of wonderful restaurants in the North End and Faneuil Marketplace. Which brings us back to the hotel's top-notch location . . . 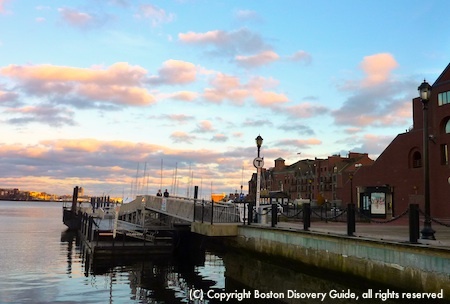 The Marriott's location on Long Wharf, constructed in 1710 and still the most bustling part of Boston’s Downtown Waterfront, is also where you can board boats for whale-watching cruises and Boston Harbor Islands cruises. 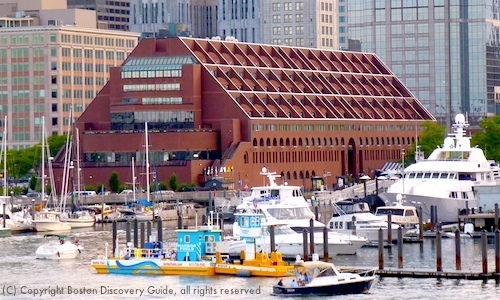 The New England Aquarium and the Freedom Trail are just a few steps away. If you're planning to go to enjoy any of these attractions, be sure to get a Boston Discount Card before you come so that you can get free admission. The hotel is also on the route for Boston trolleys, which stop at one end of the hotel on Atlantic Ave. 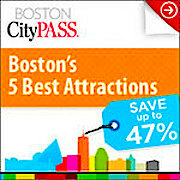 This is a hugely fun way to sightsee around Boston - and rides on the Beantown Trolley also free with the GoBoston card. 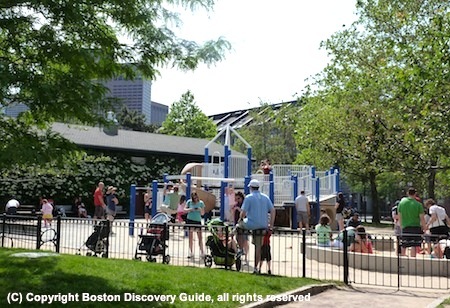 Families searching for the perfect base for a Boston vacation will find a couple of other bonuses close to the Marriott Long Wharf: a small fenced playground behind the hotel at the edge of adjacent Christopher Columbus Park, and a seasonal carousel on the Greenway, across from the hotel. For your older kids, pack a frisbee in your suitcase so that they can take advantage of the Greenway's open space. The desirable waterfront location and fun activities nearby mean that you should expect higher summer rates. During other seasons, rates usually drop and you can sometimes find great bargains. The Boston Marriott Long Wharf is rumored to have the highest occupancy rate - almost 100% - of all Marriott hotels in the U.S. I can tell you it's always bustling with families, business travelers, and special events such as weddings. If you decide to stay here, make your reservations early in order to avoid disappointment.